Correspondence chess matches: The start of the 20th century made correspondence chess matches popular in Venezuela, prompting emotions among fans and researchers who would follow press coverage and discussions in social centers. After the famous correspondence chess match between Perret Gentil and Ulder, a 3-game match was organized between Caracas and La Guaira, played by telephone between the months of June and August of 1906, featuring Pittaluga and Ruiz for the capital city team and Rivero Escudero and Perret Gentil representing the Litoral. By the end of 1909 an apoteotic chess spring produced the Telegraph match between La Guardia and Valencia; in other words between the teams composed by Perret G., Splieth Y.J. Castro versus Carvallo, Prospero Rey, Venancio Muñoz and M. Carvallo Morlor. With the start of 1911, and conmemorating 100 years of the venezuelan emancipation, an international match between Colombia and Venezuela was organized. Three games played via telegraph were agreed upon.The event was an initiative of the Bogota Chess Society whom invited The Caracas Chess Center. The colombian team included Eustorgio Arrieta, Antonio J. Caro, Guillermo Carroza and Joaquin Restrepo Tamayo. The venezuelan team was composed by Martin Ayala, R. Ruiz, Pittaluga, S. Soublette y Antonio Toro. They played for a very valuable golden Cup as well as other prizes offered by the Colombian Government. Bets were also placed by both parties. The games were followed closely by Caissa followers in giant boards placed in public meeting places. At the same time, the press in Cuba, Argentina, Ecuador, Trinidad, Curazao, England and USA commented on the match and followed the moves in detail. After the first game ended with a victory for the native team, the newspaper "El Universal" published: "Tough and hard-played game, showing the inventive, knowledgable and elegant way of play of the champions from Caracas." A second match Bogota-Caracas was played between August 1930 and March 1931, resulting in a tie. A team from San Juan de Puerto Rico faced another one from La Guaira via telegraph between 1934-1935, with the victory of the La Guaira natives. The first match via Radio took place from September 16, 1934 and June 1935 between the Barranquilla Chess Club and the Chess Center in Maracaibo, ending in one win and one draw for each team. Postal Chess started to become strong in Latin America due to the efforts of argentinian players who in the 1940's started to promote the creation of National Leagues, from the south to the north of continental America. In 1951, year when ICCF was created, Venezuela was one of the 21 american members along with Argentina, Barbados, Bolivia, Brasil, Canada, Chile, Colombia, Cuba, Ecuador, El Salvador, United States, Guatemala, Guyana, Mexico, Panama, Paraguay, Peru, Puerto Rico, Trinidad and Uruguay. The first venezuelan name in the international postal chess scene was that of Pablo Atars (1904-1976), renouned Latvian Gambit player who was not only a player but also a chess journalist, officer and organizer in Venezuela. Between 1961-1967 became a colaborator for the prestigious american chess magazine "Sacha Pasaule-Chess World", publishing a series of articles about the Latvian Gambit. 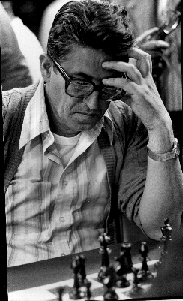 In addition, he organized Latvian Gambit thematic correspondence chess events such as the one played in 1967 where another player from Venezuela participated, Neptalí Morillo Párraga. Final standings: 1st. J.S. Morgado (ARG) 20/22, 2nd. N.R. Eckenfels (ARG) 19, 3rd. G. Toro Solís (CHI) 14.5, 4th. A.L Saavedra (ARG) 13.5, 5th. F. Acosta (CUB) 12.5, 6th. N. Morillo (VEN) 12, 7th. P. Atars (VEN) 10, 8th. V.H. Ortiz (ARG) 9, 9th. C. Torres (ARG) 8, 10th. L. Alberts (ARG) 6.5, 11th. C.H. Alvarez (ARG) 4, 12th. Olmedo (ARG) 3. Pablo Atars organized the Correspondence Chess event "Betins Memorial" (Karl Betins is recognized as the creator of the Latvian Gambit). 800 players from different countries participated producing many important theoretical progress with the development of new variations such as the Strautins Variation (3. Bc4 b5!? ), Morgado variation (3.Bc4 Nf6!? ), Budovskis variation (7.d3! in the 4.Nc4 line) and others. After Atars' passing in 1976 the american Ojars Leonhards Purins conitnued to organize the "Betins Memorial" and also the "Atars Memorial" from 1976 to 1980. 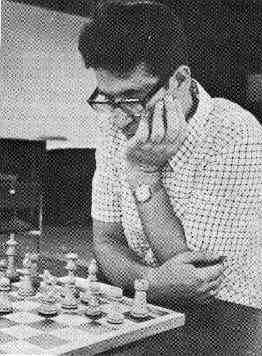 The first Postal Chess Latin American Zonal Final was organized by CADAP in 1965/1967 and won by venezuelan Celso Sánchez Pouso, tied in points with argentinian Víctor Héctor Ortiz. Tiebreak was defined by the S.B. system since both players obtained 17 points in 19 games!. 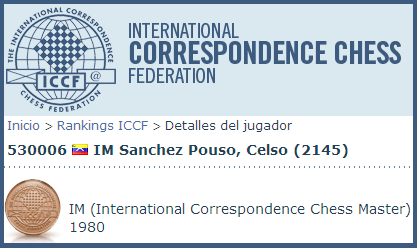 CADAP granted the title of Latin American Postal Master (MLP) to Celso Sánchez Pouso and MLP norms to the following venezuelan players: Pablo Atars (5th place in Zonal I played in 1967) and Neptalí Morillo Párraga (4th place and 76% of possible points in Zonal I in 1967). Eventually, the venezuelan Neptalí Morillo Párraga became President of CADAP (ICCF Zone 2) between 1969-1976, and Pablo Atars took part in the VicePresidents Commitee during the same time period. In 1970, the Venezuelan Postal Chess League had the following officers: Gabino Yejo Vásquez (President), Luis Valdespino (General Secretary), Pablo Atars (Tournament Director), Luis O. Aristimuño (Board Member) and Neptalí Morillo Párraga (Consultant). The postal address was Calle Real de El Guarataro, Edificio "Ala", apartment 7, San Juan, Caracas, 102. 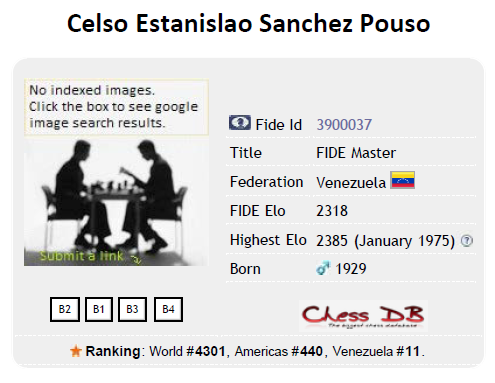 This Board issued the following announcement: "After qualification, we have designated as venezuelan representatives in the II American Individual Postal Chess Championship the following players, Epifanio Gómez Salazar, Postal Chess National Champion, and Celso Sánchez, who took second place." 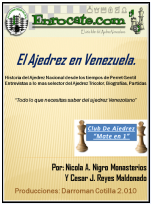 According to the Revista de Ajedrez de Venezuela (1966), "Postal chess in Venezuela started in 1965 under the leadership of Dr. Neptalí Morillo Párraga who was able to create 8 internal groups that same year. A match against Argentina on 10 boards and another one against East Germany on 5 boards." The First National Postal Chess Championship had been completed in 1966 with the gradual formation of new groups to reach a total of eleven, mixing foreigners and locals, 7 players per group.. The Champion Epifanio Gómez (from the "El Espinal") had been part of group 10 along with Dr. Rolf Spiess (East Germany), Armando Pérez P. (Caracas), Dr. Castillo Muller (Boconó), Jorge Guerra (Maiquetía), José Luis Toro (Caracas) and Prof. Arteaga (Valencia), with Armando Pérez P. as group coordinator. Source: Revista Ajedrez en Venezuela (Febrero-Marzo 1966 #3-4, page 8.). Publication sponsored by FVA, Caracas, Venezuela. The spaniard chess magazine "Jaque" reported in 1974 the final standings of the 1st. American Postal Chess Olympiad: 1. Cuba (47.5), 2. Bolivia (37.5), 3. Chile (37.5), 4. Argentina (37), 5. Uruguay (35.5), 6. Venezuela (29.0), 7. Colombia (18.5), 8. Honduras (14.0) and 9. Mexico (7.5). Source: Jaque January 1st. 1974, Year 4, Number 25, Page 38. Editor and Director José María González, San Sebastián, España. 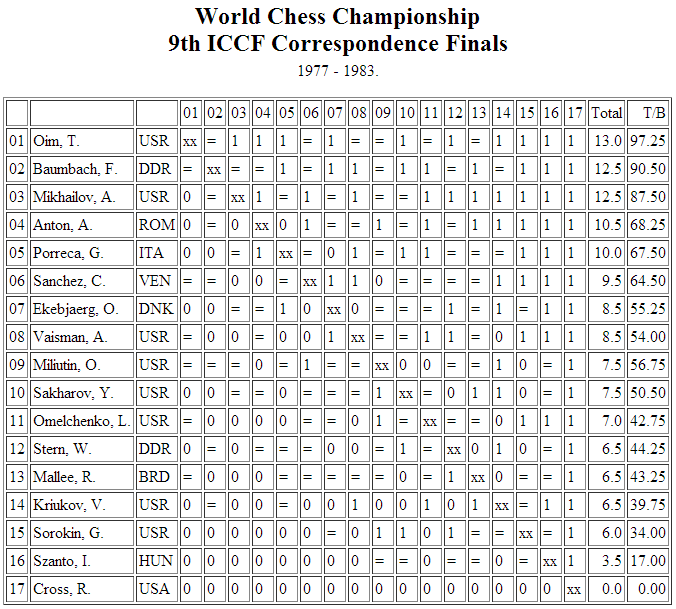 In 1977 he qualified to the IX Final of the World Correspondence Chess Championship in ICCF, event that lasted 6 years. He took 6th place amongst the top 17 players in the World. Source: transcribed from the Magazine "Jaque" (February 1960, number 2, page 5). Published in La Peña de Ajedrez "Alexandre Bóveda', in the Lar Gallego. Jose María González (coordinator), Caracas, Venezuela.